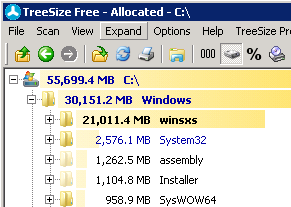 I was onsite this week and had a server with 21GB of files in the WINSXS folder which was pretty well huge in comparison to the overall 30GB in the Windows folder. To sort this, you need to do a few things. First up – install the Desktop Experience feature via the Add Features function from Server Manager. It will need a reboot, but once rebooted you will have the ability to run some new tools that were not present before. 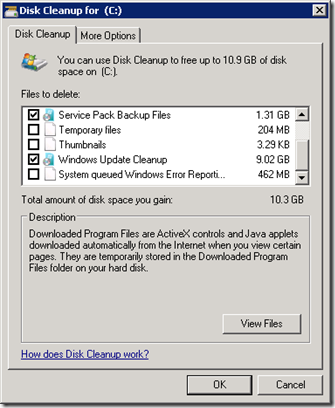 Under the System Tools program group, you’ll now have the Disk Clean-up function. Run this as Administrator and select the C: drive to clean-up. It may take a few minutes, but it will get to the following screen. 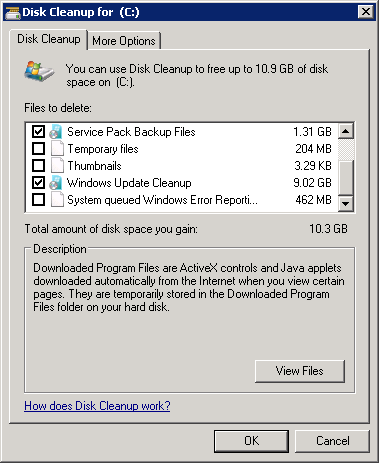 If you’re already patched to the latest build then you will see two options not present in the past – they are “Service Pack Backup Files” and “Windows Update Cleanup” – both of these contribute to around 10GB of the above mentioned 21GB of space consumed by this machine. One you select the options you want to delete and press OK – it will now go do it’s thing. It will take a while to do this – maybe even as long as 20-30 minutes, but once it’s done, you will have your space back. Once the clean-up ran above, I ran a check again – it showed some reduction, but not what I was hoping for. 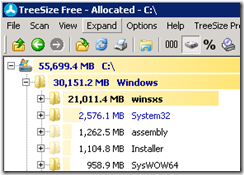 After the reboot – we have our reduced folder sizes. 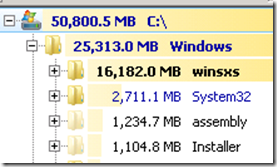 from 21GB down to 8.6GB – that’s a pretty good reduction on this older server, and one that means it can live a little longer for the client. tried this on SBS2008R2 with SP2 installed, doensn’t have the option to clean WindowsUpdate and Service Pack as shown on the image above. is there other way to do this? 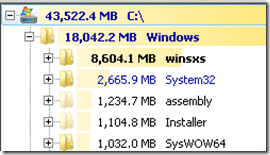 Bentw – you’ll need to use dism for cleaning up winsxs files on Server 2008 R2. I believe the command is dism /online /cleanup-image (Don’t quote me on this). Using DISM when possible is a bit less convoluted. Something I’ve scolded my techs on is using third party software, which leads to many more problems than it resolves. Addendum – I am not implying that the above post requires the use of third party software, however, I can’t think of an instance in the last ten years it’s been a viable alternative. Thanks Wayne. Processed worked perfectly for me.